Relax by the water at Patong Beach and Karon Beach. Explore the numerous day-trip ideas around Patong: Phuket Big Buddha (in Chalong) and Nai Harn Beach (in Nai Harn). Spend the 14th (Tue) among aquatic life with a scuba or snorkeling tour. The adventure continues: admire the sheer force of Gibbon Rehabilitation Project, get great views at Karon View Point, stroll through Kata Beach, and relax and rejuvenate at some of the top local wellness centers. To find where to stay, more things to do, maps, and tourist information, you can read our Patong online driving holiday planner . Alexandria, Egypt to Patong is an approximately 14.5-hour combination of taxi and flight. You can also do a combination of train and flight. The time zone difference moving from Eastern European Time to Indochina Time is 5 hours. In August, daily temperatures in Patong can reach 36°C, while at night they dip to 28°C. Wrap up your sightseeing on the 17th (Fri) to allow time to travel to Pattaya. 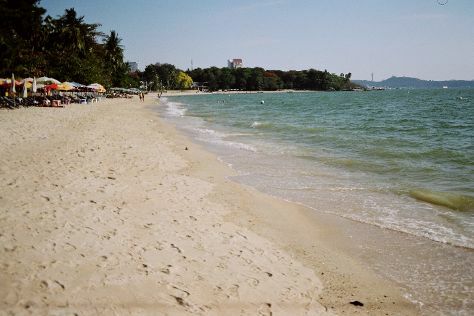 We've included these beaches for you: Ko Samae San and Pattaya Beach. And it doesn't end there: kick back and relax at Jomtien Beach, admire the natural beauty at Nong Nooch Tropical Botanical Garden, take in panoramic vistas at Pattaya Park Tower, and make a trip to Walking Street Pattaya. To find reviews, ratings, more things to do, and more tourist information, go to the Pattaya trip itinerary maker . Traveling by combination of flight, taxi, and train from Patong to Pattaya takes 3.5 hours. Alternatively, you can do a combination of flight and bus; or drive. In August in Pattaya, expect temperatures between 36°C during the day and 30°C at night. Finish up your sightseeing early on the 20th (Mon) so you can go by car to Bangkok. The Grand Palace and Temple of Dawn (Wat Arun) will appeal to history buffs. Get a sense of the local culture at Wat Pho and Temple of the Emerald Buddha (Wat Phra Kaew). And it doesn't end there: get outside with SEA LIFE Bangkok Ocean World, take in the spiritual surroundings of Wat Saket, soothe aching muscles at some of the top local wellness centers, and appreciate the history behind Democracy Monument. For other places to visit, maps, more things to do, and tourist information, refer to the Bangkok trip planner . You can drive from Pattaya to Bangkok in 2 hours. Alternatively, you can take a shuttle; or take a bus. In August, plan for daily highs up to 39°C, and evening lows to 30°C. Wrap up your sightseeing on the 23rd (Thu) early enough to travel back home.